Published in the North Island Gazette March 23, 2016. 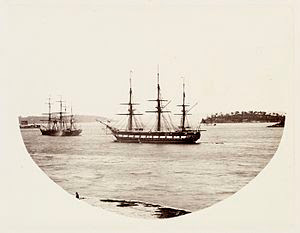 During the initial colonization period on the Pacific Coast in the 1800s, the British Navy was known for its harsh actions. Today academics refer to this as the era of "gunboat diplomacy." From 1848 - 1866 the Colony of Vancouver Island was the recognized governing body on Northern Vancouver Island. There was a disjoint, however, in that the Colony had little resources to defend itself, and relied heavily on the presence of the British Navy, which at any time might have numerous war ships in the area. One of these vessels was the HMS Clio, a steam-powered Pearl class corvette with 22 8 inch cannons and one pivot-mounted 10 inch cannon mounted on her bow, 1472 tons, and 400 hp. The Clio was based at the Pacific Station in Esquimalt, and would run regular patrols up and down the coast. On December 22, 1865 the ship had run to Metlakatla and was returning South when it stopped to check in at the Hudson's Bay Company's Fort Rupert. Staff at the Fort lived in very close proximity to the First Nation village of Tsakis, which was home to about 1500 people. At times the relationship was rocky, with both sides engaging in vigorous trade, but suffering regular skirmishes prompted by the illegal whisky trade, cultural differences, and frustration with the encroachment of Europeans into First Nations' traditional territories and the utilization of the resources within these areas. Beaver Harbour, the location of Fort Rupert, had been used by the local First Nations people for thousands of years, as evidenced by several large shell middens in the area, but it had not been a large permanent year-round village site at the time of the establishment of Fort Rupert. The availability of trade goods and preferred status trading with the Hudson's Bay Company prompted the Kwakiutl to establish a large permanent settlement on both sides of Fort Rupert after its construction. In 1851 Governor Douglas signed Treaties (two of the 'Douglas Treaties') with the bands that lived adjacent to the Fort, the Queackar and the Quakeolth. When the Clio entered Beaver Harbour in December 1865 a number of members of the Nahwitti First Nation awaited her arrival. They alleged that Kwakiutl men had murdered one of their clan. They had come seeking retribution, but Mr. Compton of the Hudson's Bay Company had convinced them to await the arrival of the Clio, and they had been assured that the men accused of the murder would be taken down to Victoria for a trial. When the Clio arrived Captain Turnour attempted to take the Kwakiutl suspects into custody, but the community refused to hand them over. Turnour threatened to open cannon fire on the village, but the community still refused to hand over the men and attempted to scare the Navy away by brandishing large knives. The Clio let off a volley of shots into the village. The First Nations took down their flags and raised a white flag and the assault was halted. That evening the First Nations started to move their belongings into the woods behind their village. They also called on the Fort and told the HBC employees that they would surrender the wanted men, but the Fort employees refused to open the gates of the Fort, wary of being taken hostage in the dispute. Painting "The Clio at Fort Rupert" by artist Mike Sedgemore provided by Hutch Hunt Sr. In the morning the Navy once again sent launches to Tsakis demanding that the community hand over the suspects. They handed over one of the three suspects, but refused to bring forth the other two men. At this point the Clio's First Lieutenant started lighting First Nation's big houses on fire, and entered the remaining houses, seizing and destroying a quantity of rum. When this did not elicit the desired response the Navy officers returned to the Clio and the ship let fly a full barrage of cannon-fire on the village. Navy destroyed the community's houses as well as all of the canoes on the beach. It is estimated that somewhere in the neighbourhood of 80 canoes may have been destroyed. Canoes were essential to life on the coast at this time including basic food gathering. This action was devastating for the Kwakiutl. When officers once again returned to the village, the community still refused to hand over the requested men, and instead the Clio took six or seven men into custody by force (one European man travelling on the Clio described it as the Navy 'taking hostages'), and delivered them to Fort Victoria. All the men were later released, but their situation prompted a debate in the legislature about whether they should be financially compensated for their loss, and whether the the Navy acted appropriately. The Kwakiutl repaired and rebuilt their houses, again in close proximity to the Fort. On a number of occasions cannons were fired upon the Kwakiutl, and one original cannon and a number of cannon balls from the period of the Fort are still in the possession of the community. Local stories are told of First Nations returning the cannon balls to the Fort being paid for their return. The Fort was sold in the late 1870s to former HBC employee Robert Hunt. Thanks to Hutch Hunt Sr. for suggesting the attack of the Clio on Fort Rupert as an idea for further exploration. He was told this story by his father Johnathan Hunt, who heard the story from his father.